If you're a teenager applying for your first driver's license, you'll need to complete either driver's training as part of a Driver's Ed course OR supervised driving practice with a licensed adult. This is a requirement of the graduated driver's license (GDL) program administered by the Arizona Motor Vehicle Division (MVD). Supervised driving with a licensed adult or a certified driving instructor will help you develop safe driving habits and build the experience necessary to ace your driving test. 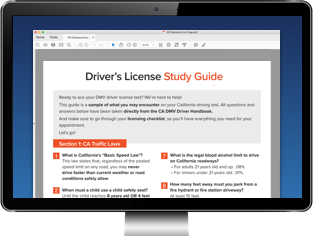 On this page you'll find information about the Arizona MVD behind-the-wheel requirements and the next steps to take to get your unrestricted driver's license. You can start your behind-the-wheel practice when you’re at least 15 years and 6 months old by applying for your Arizona learner's permit. A MVD-approved Driver's Ed program. At least 30 hours of supervised driving practice (e.g. with a parent, legal guardian, or older sibling). Let’s take a closer look at these options so you can choose the driver training that’s best for you. After completing an approved Driver's Ed program, you will receive a completion certificate, which may be used to waive your road test* with the Arizona MVD when you go to apply for your GDL. NOTE: The AZ MVD randomly selects GDL applicants with completion certificates to take the road test. Supervised driving practice is required for teenagers applying for GDLs who did not complete an MVD-approved Driver’s Ed program. Hold a valid AZ learner’s permit. Practice with an adult who’s at least 21 years old. Complete at least 30 hours of behind-the-wheel driving practice. At least 10 hours must be completed at night. Once your supervised driving practice is done, your parent/legal guardian will need to sign a Supervised Driving Practice Certificate (Form 96-0223), which you’ll provide when you go to apply for your GDL. Complete your supervised driving practice OR driver's training. For information on the documents and testing (if applicable) needed to get your GDL, head over to our complete guide for teens applying for AZ driver’s licenses. Certification of supervised driving practice required by the MVD to apply for an AZ graduated driver's license AND/OR motorcycle endorsement for a teen driver.